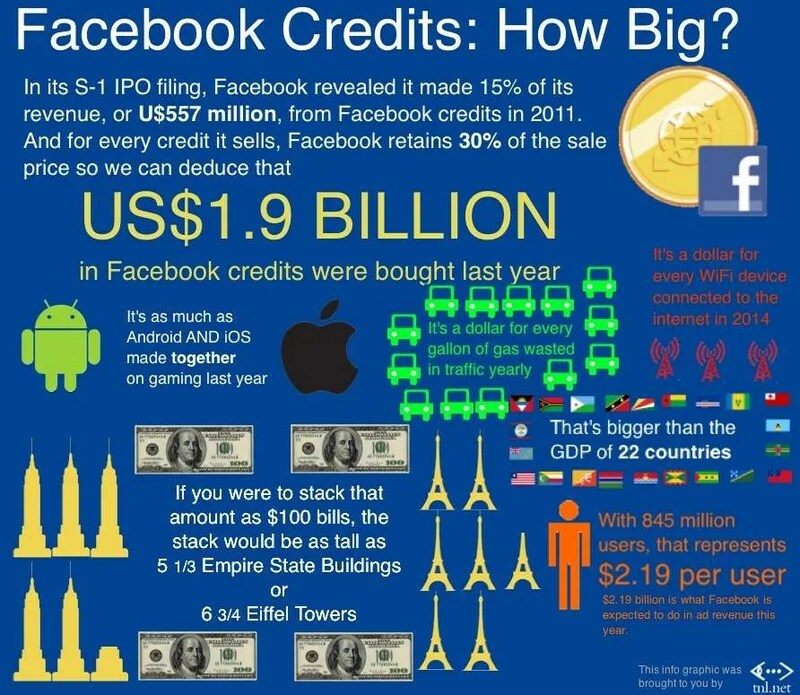 To get at the size of the Facebook credits market, I first pulled the revenue number for non-advertising related revenue from Facebook’s S1 filing. I pulled the user number for Facebook from the same document. The gaming revenue came from an interesting story on how Android and iOS are beating our traditional game devices as gaming stations. Gas consumption info from a recent report about wasted energy by the treasury department. GDP rankings came from the 2011 monetary fund report, as presented on Wikipedia’s list of countries by GDP. The Empire State building is 1250 feet tall and the Eiffel Tower is 986 feet tall. Apparently, a million dollar stack of $100 bills would be 43 inches tall. There again, simple arithmetics. The rest was me just having fun.